Have we seen the final game in Glendale? Thanks to a largely inconsistent showing and questionable goaltending from Ilya Bryzgalov, the Phoenix Coyotes were dispatched in four games by the Detroit Red Wings. 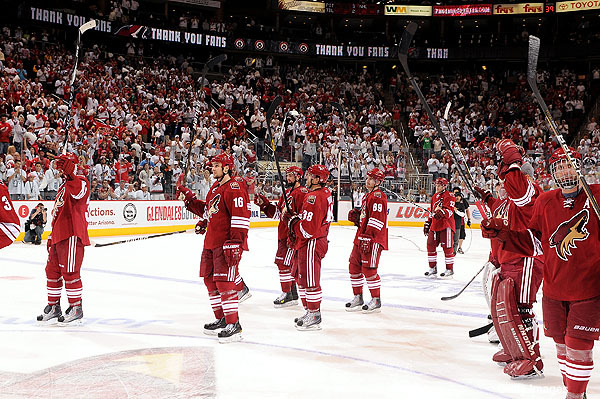 The bigger story coming out of this series is the fact that many believe that the final NHL game has been played in Glendale. I’m not so sure that is the case. Since Matthew Hulsizer came forward to purchase the Coyotes about 5,872 stories have been published regarding the pending sale. Some revolve around what Hulsizer needs to complete the purchase, some talk of the major opposition that the Goldwater Institute has posed and some talk about the potential move of the team to Winnipeg. I have said in this space before that Hulsizer probably shouldn’t be allowed to buy the team with all of this public help. If he can’t leg the deal then so be it. I also think that Winnipeg deserves to have the Jets/Coyotes return. However, I think there is more momentum moving towards saving the team rather than moving them. Goldwater has a strong case to block the sale. But I feel that there are more people in the Coyotes’ corner than in Goldwater’s. I am excluding the hockey mad citizens of Winnipeg in that distinction. In order for this deal to completely fall through you need Hulsizer to completely wash his hands of the situation. If it was me, I would be awfully close to walking away. I imagine the Hulsizer is getting to that point. However, he is getting help from the city, the NHL, Gary Bettman and the team. That might be enough to keep Hulsizer involved and the Coyotes in Phoenix. That is a big deal. More news will come this week and we very well may know the answer to all of these questions. My money is still on keeping the team in the desert. ….THE CANADIAN PRESS ….The way Roberto Luongo has been playing of late its little wonder that scoring is down again in the NHL…..The Vancouver Canucks star netminder has resembled a wall since both he and his team stumbled out of the gate during a 5-7-0 October. Luongo led the November rebound by going 8-2-2 with a 1.56 goals-against average .940 save percentage and four shutouts stingy numbers in an increasingly stingy league…..That stretch included a franchise record shutout streak of 210 minutes 34 seconds that ended Sunday in a 2-1 loss to Minnesota.